Just over a week ago I was contacted with an opportunity to give the Alter-G, an Anti-Gravity Treadmill, a test run. I have been on the path trying to lose some weight and what better option than to change the world around me rather than changing what and how much I eat! After a brief visit to fantasy land, reality once again set in and I decided it would be quite an inconvenience to walk around everywhere with this treadmill strapped under my feet, so I guess I will still need to get back to that healthy eating thing after all. The Alter-G anti-gravity treadmill is much more compact than I would have originally anticipated. While it does take up a little more room than a traditional treadmill, it is not as big as I expected it would be. 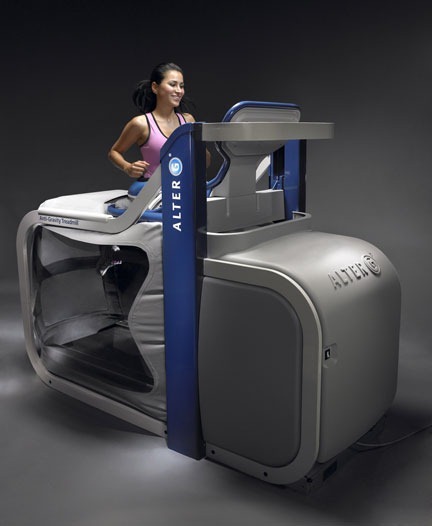 While I am thankfully not injured at this time, the Alter-G was adapted from a design originally conceived for use by the NASA astronauts with just that in mind – to help recovering athletes continue to get the benefits of aerobic training without the stress from the constant impact experienced while running or walking with full weight. 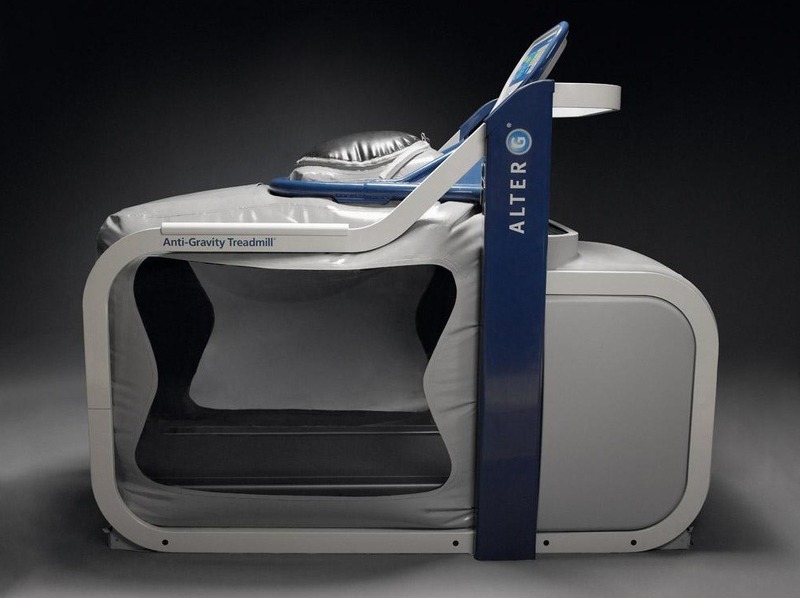 While so far I have only mentioned the medical and recovery benefits of the Alter-G, there are many elite athletes that use the Anti-Gravity Treadmill for both recovery as well as to add mileage without the stress and threat of overtraining injuries. For example, Adam Goucher, 10 time National Champion in Cross Country & Track, used it to add an extra 25-30 miles a week while training for the 2006 World Cross Country Championships, while Alberto Salazar, Director of Nike’s “Oregon Project”, uses the Alter-G to add more than 15% to his athlete's training volume. My appointment was set up with Curt Bazemore, the Director of Rehabilitation at Sports Medicine South in Lawrenceville, GA. I arrived to a house full of physical therapy patients but luckily none of them were currently using the Alter-G. Curt was obviously a complete believer in the Alter-G proven by his enthusiasm while explaining every detail. I spent some time on the website before my appointment but didn’t learn near as much as I did while talking to Curt. After the complete rundown it was time to do some running – moon style! I was handed what I can only explain as a cross between bicycle shorts and a running skirt, with just a touch of the characteristics of a hoop skirt for fullness – They were no doubt trying to make sure they were catering to the fashion conscious as well. With shorts like these you could do an Ironman without the need for a wetsuit or bicycle shorts while doing the run portion on the Alter-G…. all without the need for transitions! I pulled the shorts on with pride and acted like nobody was looking at me, no doubt envious of my outfit, as I made my way to the treadmill. After the 1/2 mile walk and the instructions he turned me loose. Not loose as in an astronaut on a space walk, but as in he turned the controls over to me and put my destiny in my own hands. I kicked it up to a running speed right around 10 mph and started to adjust the unweighting to get a feel for it. I was concerned in the days leading up to this run that I would lose my footing as I got too light so I was taking it easy with both speed and weightlessness at first. It didn’t take long before I felt some confidence and dropped the speed to a 9 minute pace, kicked the elevation to 10%, and dropped the Anti-Gravity to around 60% of my normal weight. He mentioned that it is recommended that you not run at any lower than 50% of your body weight so I wanted to play it safe. I adjusted the Anti-Gravity and alternated around 50-60%. I was not surprised with how easy it was at that point, but as I sped the pace up to an 8 minute pace I was starting to get surprised that it didn’t seem to get any more difficult. I felt like I was gliding with little to no bobbing motion, much like elite runners do. I wanted to speed it up even more, but I heeded the advice Curt gave about not trying to go too fast since it is so effortless at the lower weight. He warned that trying to go too fast without first working up to it over time could result in overextension and cause injuries like pulled muscles (he used more specific and technical terms) I have caused these exact injuries when trying to speed up at full weight so was probably a bit over-cautious, but wanted to remain healthy. I dropped the pace down into the low 7’s a little bit at the end just to see how it went and it felt like I was flying just as I expected it would. I felt very light on my feet and for a brief moment I think I heard faintly the theme music from Chariots of Fire as I ran so fluid and effortless. (set mood ) I finished the run with a 1/2 mile of dropping the pace and gaining weight quickly (10% at a time - kinda like when you eat all meat pizza with extra cheese). When I got the pace slowed back down to 10 minute pace and at 90% weightlessness I started to feel the impact quite a bit again and my legs felt very heavy. I finished it off with a walk on the moon. I slowly turned the weightlessness to the highest it would go at 20% meaning I was weighing half of what my skinny 10 year old son weighs. I literally felt like I was walking on the moon, or doing the exercises this guy is doing, still not sure which one I am closer to. The complete experience was a lot of fun. I can see a real benefit using this as a method of recovery and an alternative to pool running to keep your aerobic base at a level that makes it easier to come back following injury. Curt and I talked quite a bit following the test as well. One of the things I asked was how it was billed to insurance and if it was covered under most insurance plans. He said that it is billed as just another unit of physical therapy so the insurance company really doesn’t care. The Alter-G does cost quite a bit more than other equipment which is all billed out the same so that just shows how much they believe in it. Curt also mentioned that he has personally had issues with his knee so that he cannot run, but taking some of the weight off allows him to run up to 3 miles without any issues. We also got the chance to talk about running and injuries and what he thought about running injuries and the part shoes play in it. I will not speak for him other than to say he is intrigued by the barefoot movement as I am. If you are injured now, or find yourself injured sometime soon I highly recommend you seek out a place like Sports Medicine South to see how it works for you. You can find locations that have it both for medical and performance enhancing reasons on the Alter-G website or by visiting their communities on the Alter-G Facebook Fanpage or on Twitter @Alter_G. Who knows – as you are coming back from that next injury, you too may find yourself running fluid and effortlessly and hearing this faint sound as you are running on the moon. That is so cool that you had the opportunity to try out the Alter-G. Thanks for the great report - so interesting! This looks like something out of futurama. I can see it being a great way to recover from an injury(to encourage range of motion) and a great way for pros to add mileage. My fear is that people will get used to running on something like this, run a real(not trying to sound elitest here...), and injure themselves more since they are being encouraged to run on a greatly forgiving surface. I do like the idea of being able to decrease your weight by percentage, as it could help injured runners build up to running without the device. Can you make yourself heavier than you currently are? Saucony Is Going Minimal, Are You? Today Is National Running Day, Did You Run?